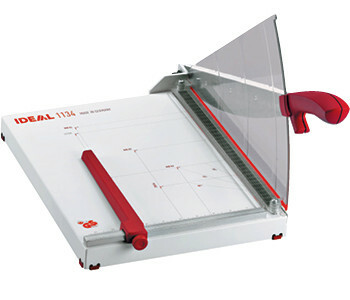 We are an authorized reseller of Ideal.MBM products, which includes a wide range of top-quality rotary paper trimmers, guillotine trimmers, stack paper cutters, and professional grade automated and hydraulic cutters for print shops big and small. Ideal.MBM is the Canadian subsidiary of Germany-based Krug & Priester, who manufacture the Triumph brand of cutters and trimmers to those famous, exacting German standards using Solingen hardened-steel blades, setting the global standard in quality, precision, and reliability. Users of Triumph brand cutters and trimmers in professional environments like print shops know that the superior quality of Ideal.MBM is worth every penny! While we show a limited list of models below to show the range products available, we carry the full line up of Ideal.MBM finishing products, which you can browse in their catalogue. VRCut is a groundbreaking PC software solution designed to automate the cutting workflow by promoting an efficient and error-free cutting process from start to finish. VRCut intelligently bridges the gap between pre-press and the finishing process, allowing operators of any experience level the ability to cut with confidence on select Triumph cutters. It’s a must have for any print shop! For more info download the VRCut Brochure. Don’t let their size fool you! These precision trimmers are not like the lower cost, lower quality trimmers from big box office supply stores. 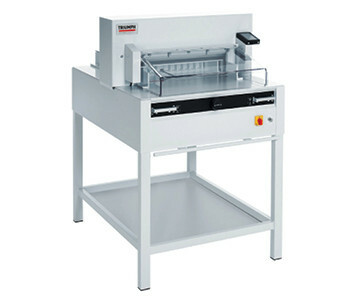 The Triumph 1030 and 1031 sport self-sharpening hardened steel blades, measuring systems etched into both the cutting table and bracket for easy alignment, and a built in protractor on the bracket for precision angle cutting. 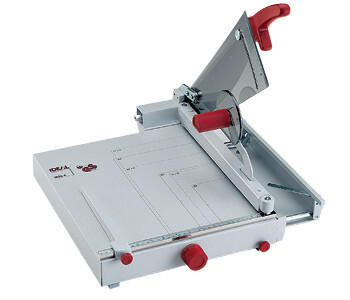 And unlike the big box store brands, these trimmers can cut through a stack of 5-6 20lb bond sheets at a time! These professional grade trimmers are made of solid aluminum, with slotted side brackets for cutting large objects, and an automatic clamp that hold sheets in place for precise cutting of stacks up to 1/32″. And of course, the self-sharpening hardened steel blade that makes Triumph trimmers so exceptional. Perfect for cutting construction plans and blueprints, posters, banners and more! These models come mounted on a solid metal frame and have a collection tray to keep your work off the floor. The slotted metal side brackets allow for cutting oversized items with the self-sharpening hardened steel blade. This powerful trimmer has a solid metal base for stability and durability, transparent safety guard, and hardened-steel Solingen blade that can be removed easily for sharpening. 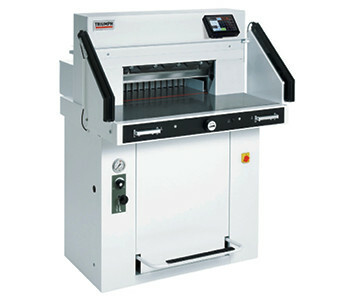 The automatic clamp presses down evenly on the stack of paper as the blade is lowered, keeping the paper steady as you cut through up to 25 sheets of 20lb bond paper at a time. The adjustable clamp on the Triumph 1038 offers more control over the amount of pressure that is applied to the stack of paper, which can be up to 50 sheets thick (using 20lb bond paper). Solid metal construction, with a hardened steel Solingen blade that is easily removable for sharpening. 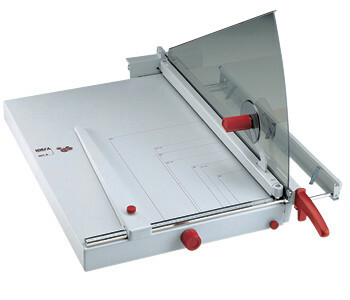 The largest of Triumph tabletop trimmers, this model can easily cut through a stack of up to 40 sheets of 20lb bond paper. The transparent safety guide allows for precision cutting while keeping your fingers safe. The adjustable paper stop keeps your paper in place and aligned for cutting to standard and custom sizes. Solid metal construction with a hardened steel Solingen blade that is easily removed for sharpening. 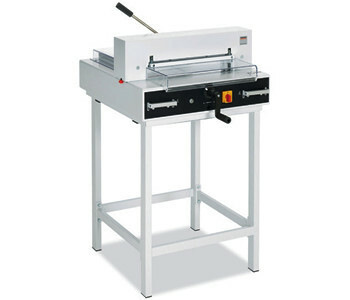 This entry-level manual stack paper cutter can sit on any sturdy table, or can be configured with an optional stand (pictured) or cabinet. The cutting lever gives you enough leverage to easily cut through a stack up to 0.75″, and can only be engaged when the transparent safety cover is locked in place. The hardened steel Solingen blade can be easily removed for sharpening, and the patented, lever-activated fast-action clamp keeps the stack of paper firmly in place to allow for precise cuts every time. The Triumph 4705 tabletop cutter can breeze through stack of paper up to 2.75″, while the fast action clamp not only keeps the thick stack of paper precisely in place, but also ensures operator safety. The spindle-guided back guage is adjustable with a calibrated manual crank. The manual spindle clamp is guided on both sides to apply even pressure along entire cutting width. 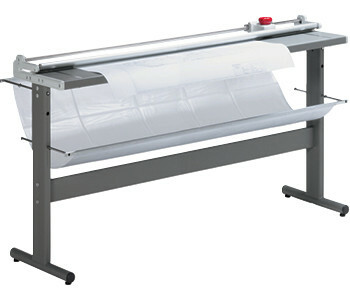 Cutter can be placed on a sturdy table or can be configured with the optional table (pictured). 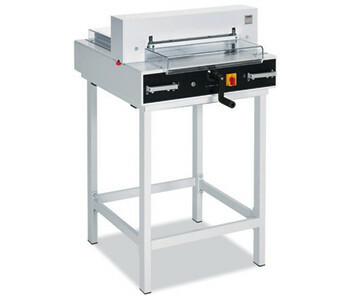 The Triumph 4315 is a dependable semi-automatic tabletop cutter with an electric blade drive, manual fast-action clamp, and EASY CUT blade activation that can slice through a paper stack up to 1.5″ thick. 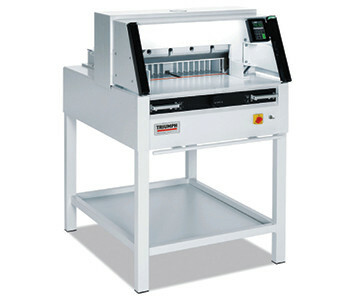 The bright LED cutting line ensures precision cutting of full bleed documents and marketing materials. Can be positioned on any sturdy table or configured with the optional stand (pictured). 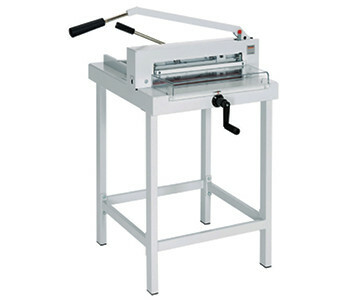 This easy to use, fully automatic cutter makes quick work of cutting through paper stacks up to 1.5″ with an electric blade and clamp drive. It features a spindle-guided back gauge with calibrated crank, front table digital display (cm or inches) for precise back gauge positioning, a bright, LED optical cutting line and precision side guide. The high quality, German steel blade comes with a solid steel blade carrier and adjustable blade guides. All-metal construction. Optional stand (pictured), or cabinet with storage shelves available. This programmable cutter can make quick work of jobs requiring many precise steps, like cutting through large sheets of business cards. Can cut through stacks up to 3″ thick. The standard table provides an ergonomic 37″ working height. Features an electronic hand wheel with variable speed control for manual back gauge setting, bright, LED optical cutting line, and an adjustable, spindle guided back gauge with narrow separations and plastic gliders. The high quality German steel blade can easily be removed for sharpening or replacement. Comes with one year license of VRCut software for easy programming of complex cutting jobs. Can cut through stacks of up to 3″. Comes fully loaded with safety features and programming capabilities. Solid metal construction, with a German hardened steel blade that can be easily removed for sharpening or replacement. Full specs available in the Triumph catalogue or spec chart at the top of the page. VRCut brochure also available at the top of the page. 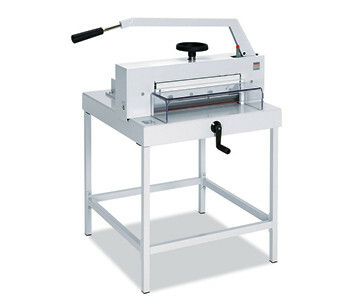 Features a Hydraulic blade and clamp drive that can easily slice through stacks up to 3.75″ thick. Foot pedal for pre-clamping. Electric back gauge drive with touchpad for easy programming. Digital measurement display (cm or inches) with multilingual operator guidance, accurate to 1/10 mm or 1/100 inch. Stores 99 programs with up to 99 steps in each (up to 15 repeat cuts can be integrated as a single step). Pre-programmed for standard paper sizes. Memory key for repeat cuts. Automatic SET function for reference measurement and EJECT function for pushing out paper. Self-diagnostic system with error indication on display. Electronic back gauge control with variable speed control for manual back gauge setting. Clamp pressure is fully adjustable between 1,900 and 3,800 psi. False clamp plate. Bright, LED optical cutting line. Stainless steel work surface. High quality, German HSS blade. Precision swing cut blade movement. Aluminum blade carrier and clamp bar. Adjustable blade guides. All-metal construction. Mounted on casters. Includes easy-access tool holder and paper blocking tool.